“Protecting The Nation From Foreign Terrorist Entry Into The United States.” That’s the title, and the ostensible purpose, of President Trump’s controversial (to put it mildly) executive order suspending entry into the U.S. for nationals of seven predominantly Muslim countries. Critics were quick to point out, among a slew of other objections, that no individual hailing from any of the affected nations—Iraq, Iran, Libya, Somalia, Sudan, Syria, and Yemen—has ever committed a terrorist act on U.S. soil. Oklahoma City, an ideally timed new documentary about the 1995 bombing of the Alfred P. Murrah Federal Building, complements this argument, serving as a potent reminder that terrorism isn’t always, or even frequently, the work of nefarious foreigners dead set on obliterating our freedom. Sometimes, it’s homegrown white nationalists—like, oh, the ones currently cheering this development—who represent the biggest threat. Because director Barak Goodman explicitly makes this the film’s thesis, Oklahoma City is somewhat misleadingly titled. 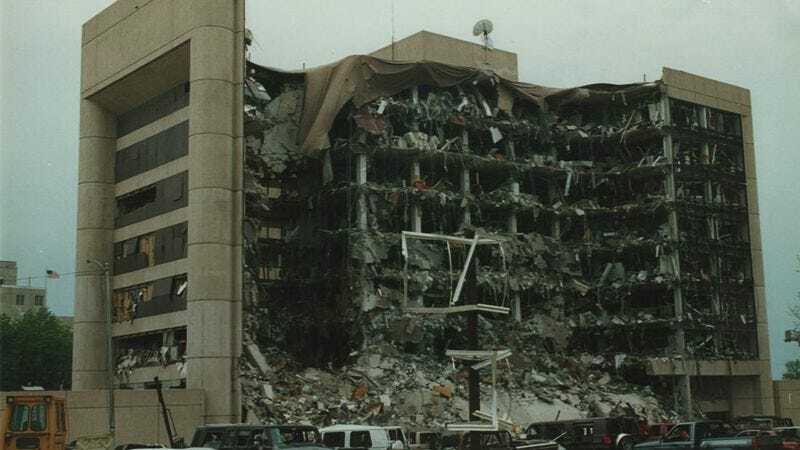 It’s not an in-depth examination of the bombing itself so much as it’s a history of the key events that influenced Timothy McVeigh, the man who was primarily responsible. McVeigh saw his actions—which killed 168 people, including a group of children attending a daycare center in the building, and wounded hundreds more—as a necessary counterattack against the federal government, following two notoriously botched standoffs between the FBI and armed citizens. Roughly a third of the documentary details what happened at Ruby Ridge, Idaho, in 1992, while another third or so tackles the Waco, Texas, fiasco of the following year. Various talking heads explain the genesis of both tragedies, focusing in particular on the ways in which the Weaver family (at Ruby Ridge) and the Branch Davidians (at Waco) intersect with white-supremacist organizations. McVeigh’s ties to the movement are shakier, but he sold The Turner Diaries, a racist novel written by a prominent white nationalist leader, at various gun shows; his choice to use a truck bomb at a federal building was very likely inspired by its ending. Some will find the film’s somewhat circumstantial evidence unpersuasive. McVeigh never belonged to any extremist group, and his anger over Ruby Ridge and Waco doesn’t necessarily reflect the ideologies of the people who died there (which are murky to begin with, apart from a shared desire to live apart from society at large, with lots of weapons). The bigger problem, though, is that Oklahoma City has little to offer any viewer already familiar with the basics of these three events, each of which gets fairly superficial treatment here. Goodman clearly wants to take the same expansive, analytical-historical view of McVeigh that Ezra Edelman took of O.J. Simpson, which is commendably ambitious. But there’s a reason why O.J. : Made In America needed to be nearly eight hours long. Oklahoma City, with its standard running time, is forced to zip through fearsomely complex material, providing just enough context to connect the dots it wants to connect. (It’s also the kind of movie that still thinks using yarn to connect photos and newspaper headlines on a cork board is a good visual idea.) Goodman is reportedly now making an entire separate documentary just about Ruby Ridge, so maybe he’ll put together a more comprehensive version of this film down the road. For now, however, it’s useful mostly to people who know little or nothing about the subject matter, and as proof that slamming the door on Muslims can’t magically solve terrorism. Plenty of potential terrorists were born right here.